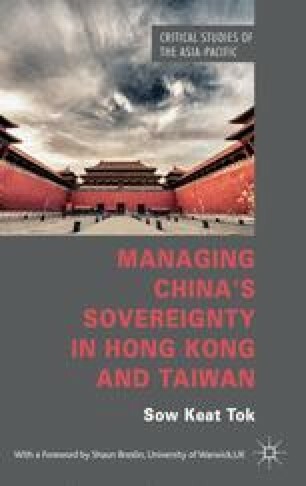 This book began with discontent over the common (mis)assumption about China’s stand on sovereignty affairs: that Beijing holds on to a rigid, absolute, and somewhat “Victorian” or even “Westphalian” view of the concept of sovereignty (Segal, 1994, p. 34; Johnston, 2003, pp. 13–14; Ash, T. G., 2009), such that its policy actions and behaviours are motivated by that view. This assumption, however, does not reconcile with the compromises that China has made on its sovereignty affairs, in particular where issues are closer to home, in Hong Kong and Taiwan. These observations raise doubts over the validity of this primary assumption of China.